Today I wore the “Sorry” t-shirt I got from the Irish. It’s a comfortable black cotton short sleeved t-shirt with only one word screen printed across the front – “Sorry.” I wore it for no particular reason, other than it was the next up in my hanging locker. As I pulled it on, I remembered the sage words offered by Gavin Quinn of Quinn’s Marine in Cardigan, PEI. Gavin came to the Windleblo last fall to assess my diesel engine maintenance needs. He is a wizened character who clearly has many stories banked. Over a cold engine, we got to talking and I learned that he had been married to the same woman for more than 50 years. When I complimented him on this, he offered his secret to marital longevity. “You know what it takes to be married to a woman for that long, don’t you?” he asked. “What’s that, Gavin?” I replied. Then he took a long pause. I waited expectantly. We chuckled, and I thought of the Irish “Sorry” t-shirt as I wondered about the power of apology. An apology can come in many ways. Implied or overt. Immediate or delayed. Casual or serious. I’ve tried apologizing pre-emptively to my children, without effect. Emily rejects it out of hand, so I suppose to be most effective, an apology must be timely and sincere. Regardless, on this particular day I feel I have nothing to apologize for. Things are going quite well, I think. 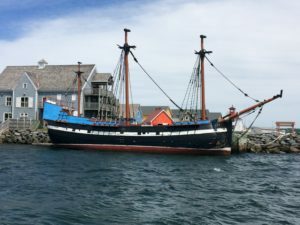 We’ve done the heavy lifting of sailing all the way to international waters and back, and my email inbox today contains the canceled E29B permit from Ellen Downey, my new best friend at the Charlottetown Canadian Border Security Agency office. We are now free and clear with the authorities. Despite bashing into the waves for 30 nautical miles yesterday, my first and only mate still hasn’t tried to swim to shore, but perhaps subconsciously I chose today’s t-shirt because of the trial that voyage proved to be, though why I should be responsible for the weather, I do not know, other than the captain is always to blame when things get tough. Lord knows, we’ve learned the hard way many times that it’s best to be a downwind boat. Yesterday was just another chance to relearn that. 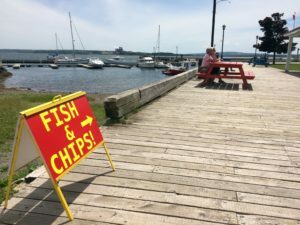 But given the prospect of sitting on the dock in Port Hawkesbury or swinging at anchor in Havre Boucher for a three day blow vs. making it to Pictou, it seemed like it would be worth the pain of beating upwind for an afternoon. With that behind us, now we find ourselves tied to a dock at Hector Quay Marina in Pictou, Nova Scotia. The wind continues to roar and the skies turn leaden from time to time, occasionally unloading some rain. Every so often after one of these pulses of energy passes by, the wind backs more southerly, blowing a foul stench towards to town from the pulp factory due south across the harbor. When this happens, it seems not everything in Canada is pure and clean. 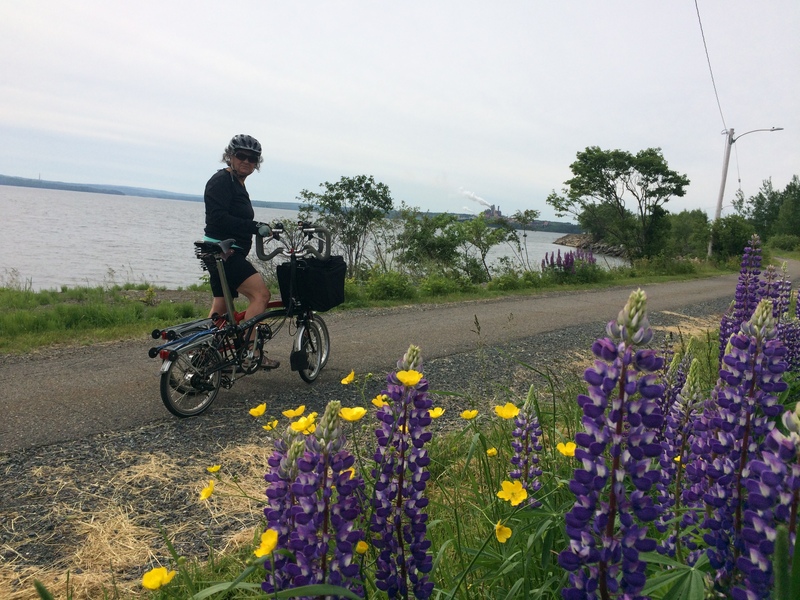 Overlooking the stench, Pictou is quite a pleasant place. 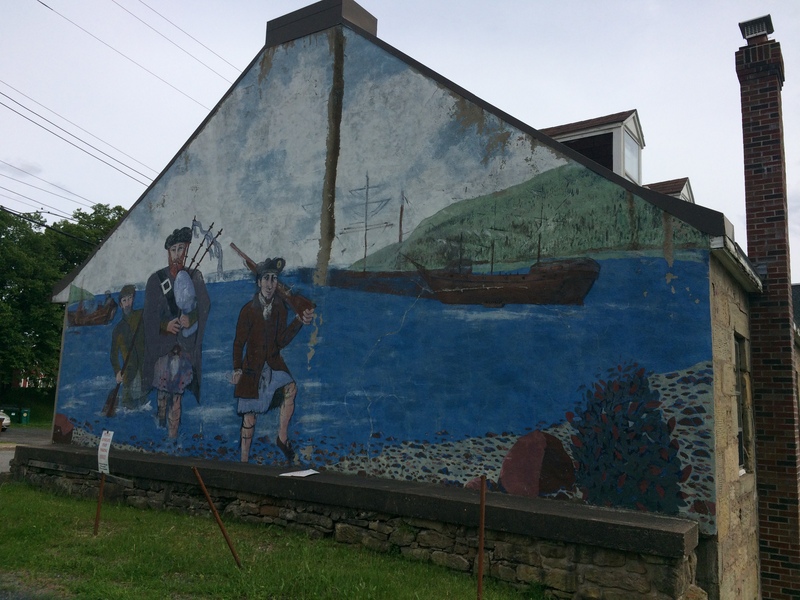 The town’s tourism slogan is “The birthplace of New Scotland,” as it was here in 1773 that the first wave of Scottish immigrants arrived aboard the Hector. As if to confirm this heritage, we were greeted by an assemblage of bagpipe performers on the quay as we made our first foray ashore to find a watering hole. This quaint town offers many tourist boutiques and interesting restaurants, a performing arts center, a comfortable library, and even an outlet store for Canada’s only remaining knife manufacturing factory, Grohmann Knives. The town has several public squares, many with handsome statues and plaques. There’s even a fisheries museum. 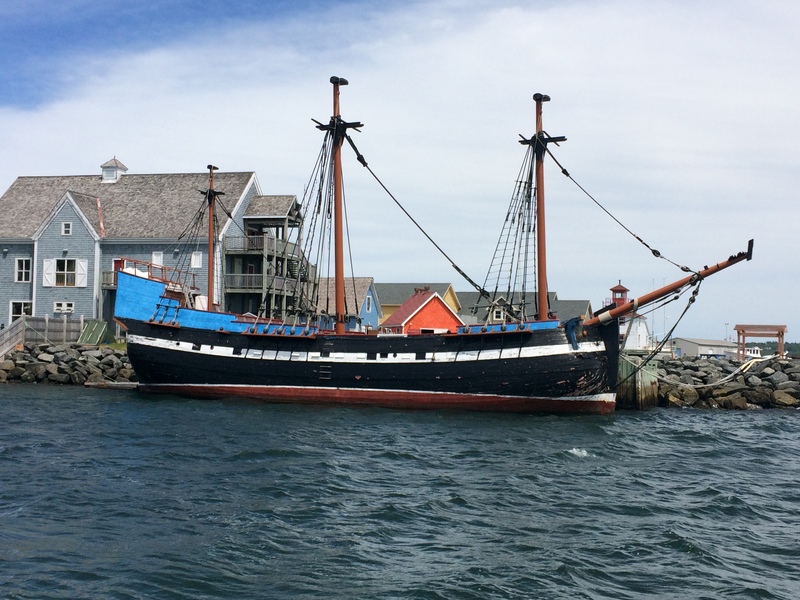 The Tall Ships are scheduled to visit here June 30th. 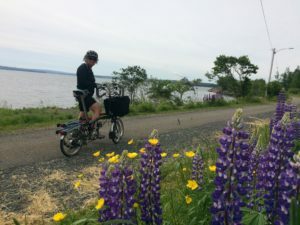 Tomorrow, we break out the Brompton folders to explore a bit further afield on the portion of the Trans-Canada trail that transits Pictou. This rails-to-trails conversion is now available for hikers and bikers. We can use the exercise.